The measure passed by the Senate was filed as an amendment by Republican Senator Rob Schaaf of St. Joseph, an often-vocal critic of Greitens who has had numerous public spats with him. The underlying bill requires county commissions to fill vacancies in county elected offices by designating a replacement until the Governor makes an appointment. Lawmakers will convene a special session Friday at 6:30 p.m. after the regular session ends to explore whether to impeach Greitens. If the House votes to do so, state law calls for the governor to be suspended from his office. Staff members of sitting Republican Lieutenant Governor Mike Parson have told Missourinet it’s their understanding that Parson would then assume the day to day responsibilities of the governor’s office while Greitens would still occupy the governor’s mansion. If Greitens were to be convicted by jurists elected by the Senate in the impeachment process, Greitens would be removed from office and Parson would become governor. The measure passed by the Senate would enable Parson to appoint a lieutenant governor to replace the seat he had vacated. The appointment would be subject to Senate confirmation through the advice and consent process. Schaaf initially offered his amendment in early May when the underlying bill first came to the Senate floor. At that time, Democratic Senator Scott Sifton of Affton offered an alternative amendment which would have called for a statewide public vote to fill a vacancy in the lieutenant governor’s seat. But the sponsor of the underlying bill, Republican Brian Munzlinger of Williamstown, withdrew the legislation before either amendment proposal was voted on. 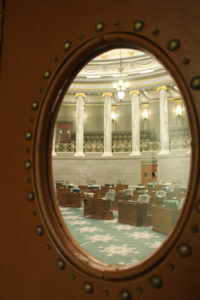 Then Friday, Republican leadership in the GOP dominated chamber brought the bill back to the floor. During floor debate, Senator Sifton said voters should choose who should be the state’s lieutenant governor. Sifton’s offering was rejected by the chamber. But before Schaaf’s measure was approved, a few fellow Republicans voiced their concerns. Senator Bill Eigel of Weldon Spring said he was troubled that more power would be vested in the governor at the legislature’s expense. “I feel like the legislative branch has already seen its influence eroded, simply from the fact that we are not in session full time to continually provide checks to the other two branches,” said Eigel. Senator Bob Onder of Lake St. Louis said he thought the separation of powers could be threatened if the Senate had confirmation powers over an elected statewide office. He also said the Senate and the governor could face a contentious battle over who should be appointed lieutenant governor. Ultimately, both Onder and Eigel voted in favor of Schaaf’s measure along with 24 other Senators from both parties. Three Senators, Sifton and fellow Democrat Jill Schupp of Creve Coeur and Republican Ed Emery of Lamar voted against it. The legislation to allow the Governor to appoint a lieutenant governor to fill a vacant seat is now in the Missouri House.